I’m often asked how an athlete or active person can know if his or her shoulder injury is serious. Should he ice his shoulder and rest it for a day or two and see if his pain and use of the arm improve? Or should he go to an emergency room or see an orthopaedic surgeon right away? In this article, I share 5 signs your shoulder injury is serious. Similar to a post I wrote on signs that your knee injury could be serious, this post tries to offer some signs and symptoms that could represent a serious shoulder injury. This list is by no means comprehensive. It also is in no way meant to serve as specific medical advice, so please see your doctor or orthopaedic surgeon if you’re concerned or have questions about your shoulder injury. Your shoulder popped out of place. If you suffered a shoulder dislocation, especially a traumatic dislocation that required reduction in an emergency room, there is a good chance that you tore the labrum and/or stabilizing ligaments and stretched out the capsule. This fact is especially true if you are younger than 21 years old. Recurrent dislocations and instability can commonly result from these injuries, and sports medicine surgeons often treat these injuries with surgical stabilization. You have an obvious deformity. If you landed directly on your shoulder or someone hit you directly on your shoulder, it is possible you suffered a fracture or joint injury. An obvious deformity where part of the collarbone is sticking out likely represents a clavicle fracture. A large prominence at the top of the shoulder could signify an acromioclavicular joint (AC joint) injury. And the crooked appearance of the upper arm could represent a proximal humerus fracture. You have difficulty lifting the arm. Pain can make it difficult to lift your arm. If you can tolerate the pain and still do not have the strength to actively lift your arm (not using your other arm to do it), then you could have a rotator cuff tear or other structural injury. You notice a clicking or popping sensation deep in the shoulder. This symptom is tricky, because popping means different things to different people. While it is by no means a definitive sign of a labral tear, I’ve seen many young adults who complained of an uncomfortable popping in the front of the shoulder and deep within the shoulder. They often feel it doing a bench press, military press, or push-up. Again, this complaint is not diagnostic, but it could represent a labral tear. You have pain reaching across your body. This sign can result from chronic issues in weightlifters, bodybuilders, collision sport athletes, and manual laborers. As such, it could represent distal clavicle osteolysis or osteoarthritis of the acromioclavicular joint (AC joint). 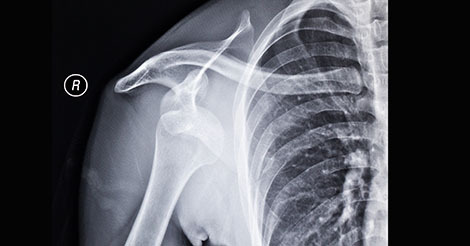 After a traumatic injury, it could represent an AC joint injury. Again, this is not at all a comprehensive list of signs and symptoms that a shoulder injury is serious. I would be curious to hear if you have other signs to add to this list. Also, this post is not intended to replace evaluation by physician. 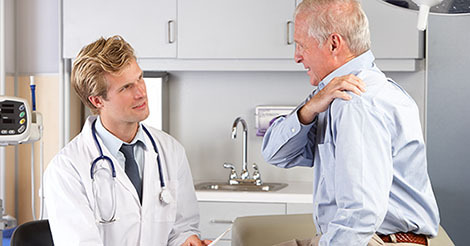 If you have suffered a shoulder injury and have specific questions or medical concerns, you should consider going to the emergency room or seeing your doctor or orthopaedic surgeon.